Here's a tiara that goes by many names, all of which refer to its main motif: some see it as a papyrus leaf and name it accordingly, while others call it a lotus flower and name it as such. (For the record, the tiara is mentioned in Geoffrey Munn's Tiaras: A History of Splendour and Hugh Roberts' The Queen's Diamonds, both of which refer to a lotus motif, hence the name we'll use today.) Whichever way floats your boat, it's still a delicate diamond tiara of fanned motifs crowned by floating diamond arches and studded with two pearls at the base and a central top pearl. 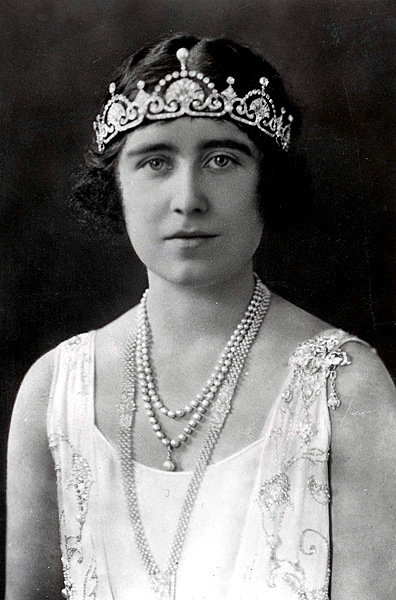 Much like the Strathmore Rose Tiara, this was seen on the Queen Mother in her early years as Duchess of York and was subsequently retired from her regular tiara rotation. 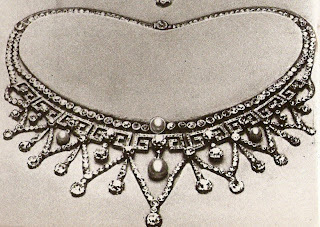 It was made from one of her wedding gifts, a necklace of a Greek key pattern with pendant diamonds and pearls given by her husband, the future George VI. Garrard dismantled it and created this tiara instead - an excellent reworking, if you ask me. 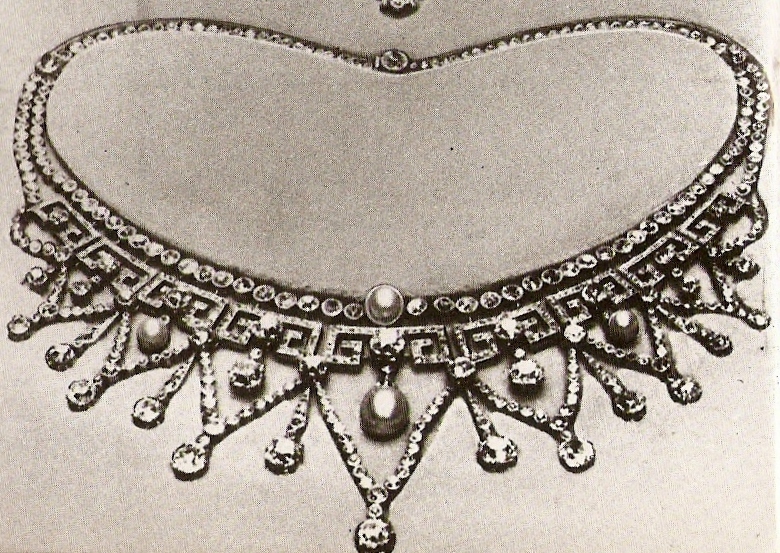 The then-Duchess of York wore it in the fashionable bandeau style across her forehead, but it is equipped to be worn in traditional style at the crown of the head as well. This is how her daughter, Princess Margaret, wore the tiara after the Queen Mother gave it to her in 1959. 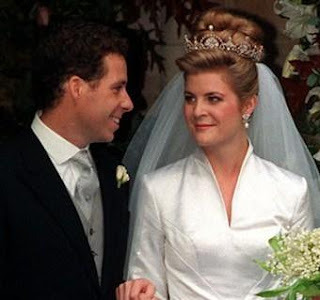 Margaret's use of the tiara is my absolute favorite. She wore it most often in her younger years, and it really shines on a youthful wearer. It certainly did so when she loaned it to Serena Stanhope for her wedding to Margaret's son Viscount Linley. Princess Margaret passed away in 2002; a selection of her belongings, included the Poltimore Tiara, was sold in 2006, but this tiara was not included. So we assume it still belongs to someone in the family, likely one of her two children. I have always loved this tiara for its dainty design (it's almost girlish, but in a pretty way and not a costume dress up way) and its sparing use of pearls (which is just enough to leave a pearl impression but not quite enough to make a proper pearl tiara). My love for this tiara prompts me to hope that it will end up back in the main royal line so that we can see it in regular use once again. Part of me hopes Margaret left the tiaras with family history to her sister; and if they're with her children still, that they won't make it to the auction block next. Whatever happens, it will forever be in my own imaginary jewel vault. UPDATE: Apparently this did indeed make it back to the main collection - the Duchess of Cambridge wore it for her first public tiara appearance after her wedding, the Diplomatic Reception at Buckingham Palace on December 3, 2013. Does this own a place in your ultimate tiara collection? Click here to see the rest of my Ultimate Tiara Collection.